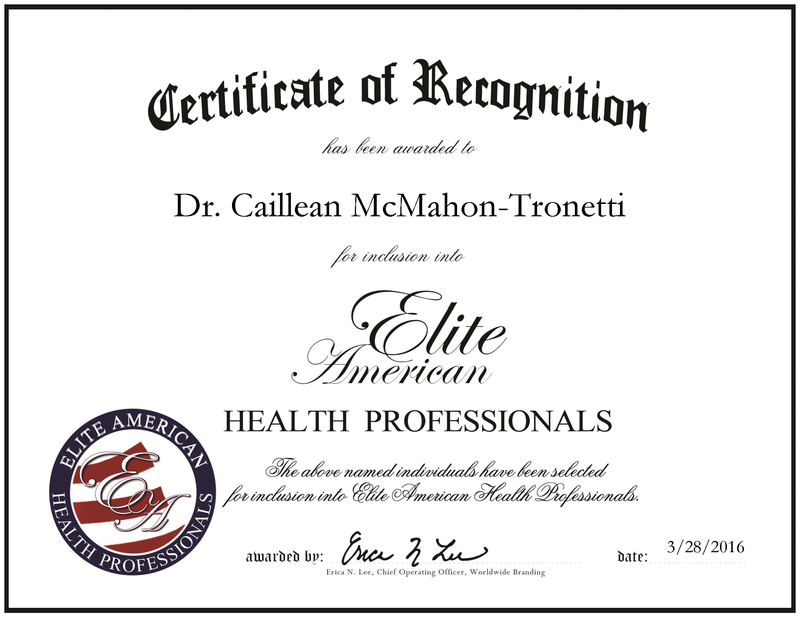 Dunkirk, NY, March 28, 2016, Caillean McMahon-Tronetti, Medical Director, has been recognized by Elite American Health Professionals, for dedication, achievement and leadership in mental health care services. For nearly three decades, Dr. McMahon-Tronetti has championed mental health care services. Providing confidential and discreet assessment and evaluation of individuals, she strives to find the best treatment plans that include individual therapy and group therapy. These therapies are designed to assist the individual with an understanding of self, and help develop important skills. She is an expert in forensic psychiatry, developmental disabilities, autism and addiction. To provide these extensive and thorough services, Dr. McMahon-Tronetti pursued several postdoctoral fellowships. She has completed these fellowships in electro-seizure therapy, and in medicine and forensic psychiatry. In order to stay current with her field, she has taken supplementary coursework at Duke University and Temple University. In 1993, Dr. McMahon-Tronetti was recognized for her work with the Exemplary Psychiatrist Award from the National Alliance for the Mentally Ill. In 1996, Dr. McMahon-Tronetti published her research articles. She directs mental health programs in psychiatry and forensic psychiatry for The Resource Center. She provides these behavioral programs in Jamestown and Dunkirk, as well as the Chautauqua County Jail. In addition to these services, Dr. McMahon-Tronetti also provides case management services, referral services and management of gay, lesbian and transsexual treatment services. This entry was posted in Mental Health Care, Research and tagged case management, forensic psychiatry, medical director, mental health, therapy. Bookmark the permalink.